This beet salad can use beets that are roasted on the grill or in a hot oven. 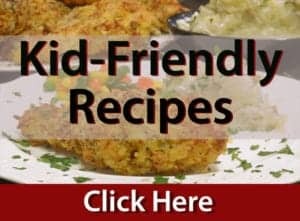 With either method, you get a simple and healthy salad entree or side dish that is popular with even people who thought they didn’t like beets! Fire up the grill or the oven for this easy and tasty beet salad. I grew up eating canned beets from my mom’s huge farm garden. I guess that makes me a lucky man because thanks to her hard work and kitchen talent, I have been a life-long lover of beets. Many people don’t care for this healthy root vegetable but let me fill you in on a little secret: This beet salad recipe has converted more than one former non-lover of beets! Make this beet salad as a salad entrée or a wonderful side salad. Use about 8 small beets for this roasted beet salad. Start by firing up your gill, or turing your oven on to about 400° F. Next, wash about 8 small beets, dry them off and place them on a large sheet of foil-lined cookied sheet. Add some olive oil and take another sheet of foil and seal the package nice and tight! 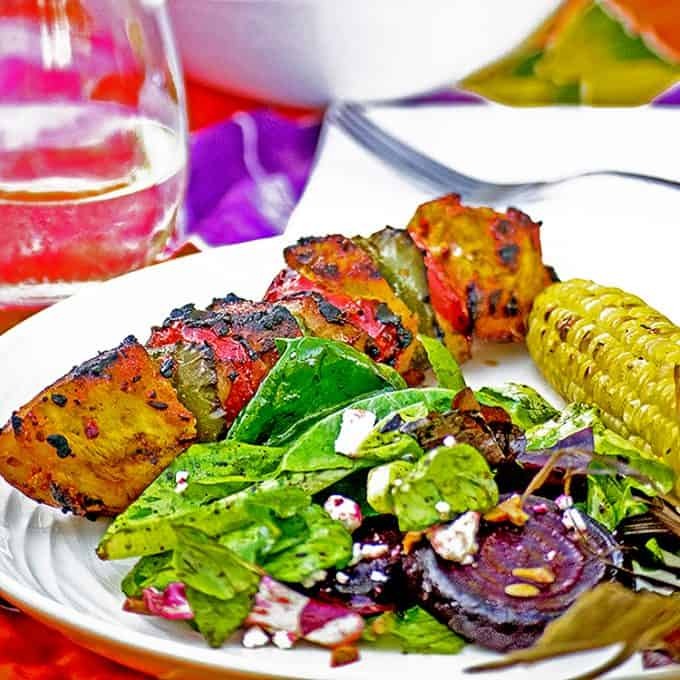 Summer is the perfect time to use your grill for this roasted beet salad. For this beet salad recipe, my Weber grill reached a temperature of about 550° and these beets roasted beautifully in about 20 minutes. We’ve roasted beets in the oven many times in the past but why would I waste a beautfiul July day using my oven when I can use my out door grill?! Toasting almonds will enhance their flavor and add a little extra crunch. After about 20 minutes on the grill or in the oven, take the beets out and let them cool. This is a good time to toast up some almond slivers in either your oven or on your grill. 8 minutes at 350° F. should provide a lightly toasted nut. The next thing you want to do is make the super easy dressing for this beet salad. Always use the best quality olive oil and balsamic vinegar you can find. Simply mix a little olive oil with balsamic vinegar. If you’re lucky enough to have some high quality and aged balsamic vinegar, use it in this recipe. The cost is a bit higher than the cheap stuff but the pay-off comes in a much better tasting dressing. 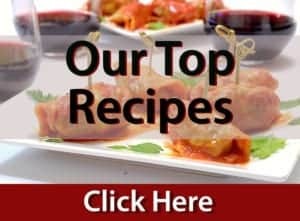 You can eyeball the amounts of each ingredient, figure on using 3 or 4 tablespoons of each. Season with kohser salt and fresh ground black pepper. Put on a pair of food gloves when peeling the beets, to help keep your hands from turning beet red! Once the beets are cool enough to handle, it’s time to peel the beets. This is super simple, using your hands and a little rubbing power. 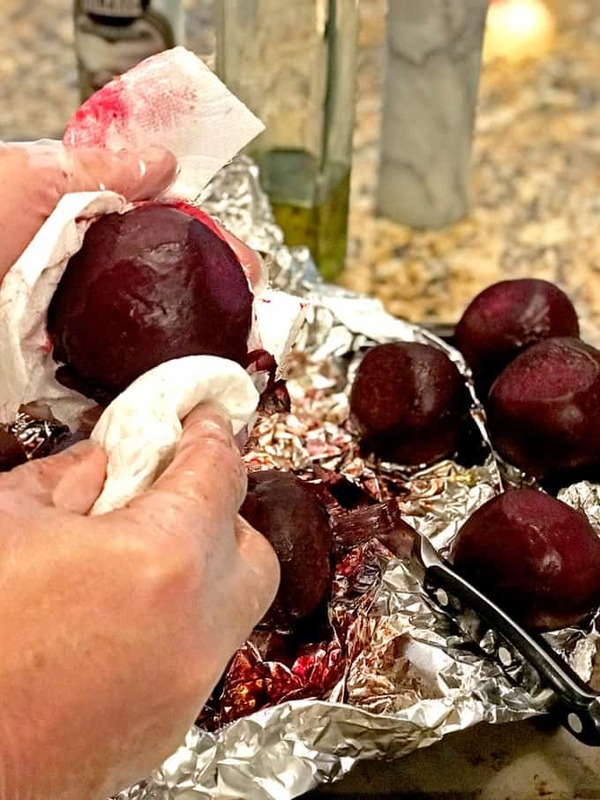 If you have a pair of food handling gloves handy, slip them on and then grab a couple sheets of paper towel to rub the skin off the roasted beets. 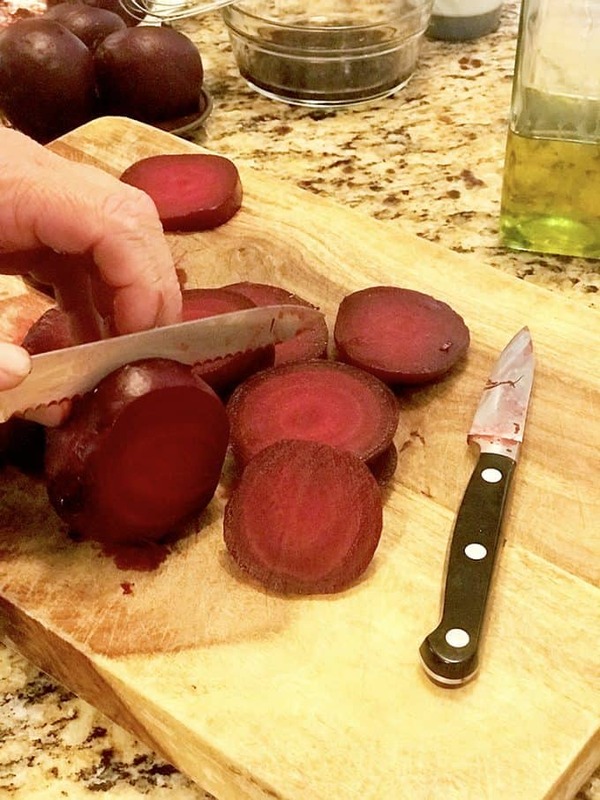 Use a serrated knife to make clean slices of the roasted beets. Mark the beets on your hot grill. For a little extra pizzaz, take the sliced beets and mark them on the grill. This takes just a couple of minutes but will elevate your salad to a higher level. Of course this step is optional but why waste those hot coals if you have them?! 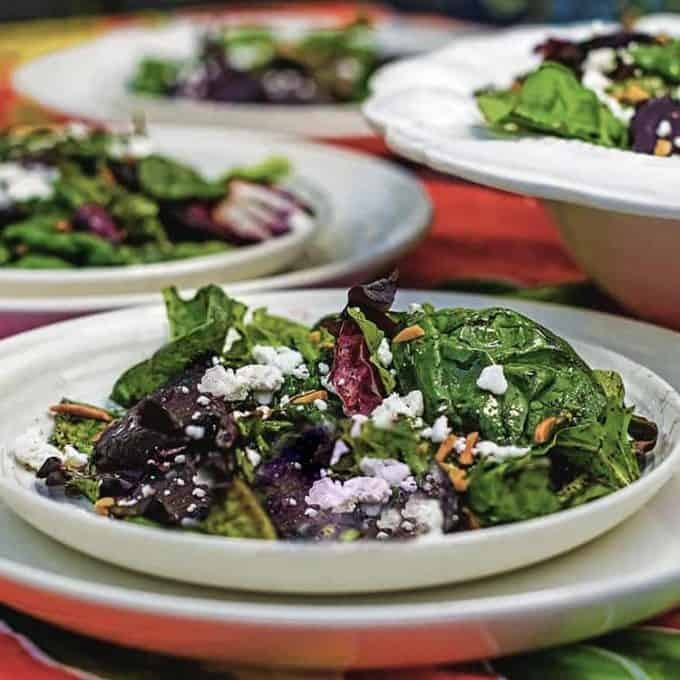 Once the beets are marked and cooled a bit, just toss them in the spring mix, add the toasted almonds, dressing, and sprinkle on some crumbled goat cheese. How easy is that?! 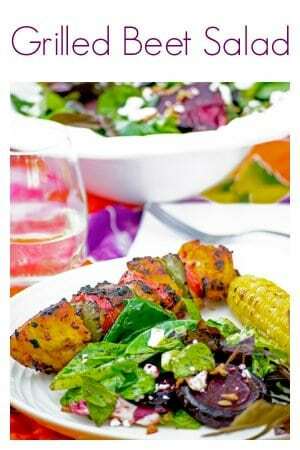 Enjoy this roasted beet salad as a tasty and attractive side. This delicious beet salad is simple to make and you can serve it as a main course or as a side salad. 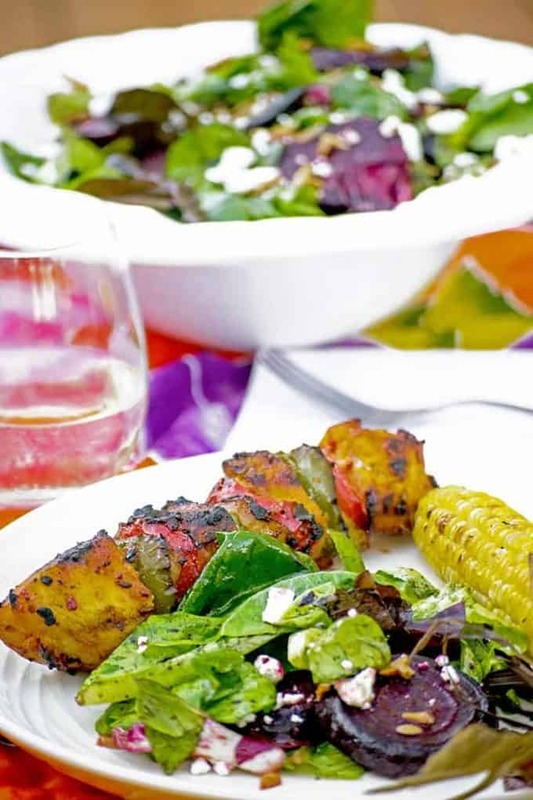 We found this recipe over at Grilling Wino, be sure to check them out! Preheat oven to 400° F or heat grill to high setting. Remove stems and roots from beets and then wash and dry them. 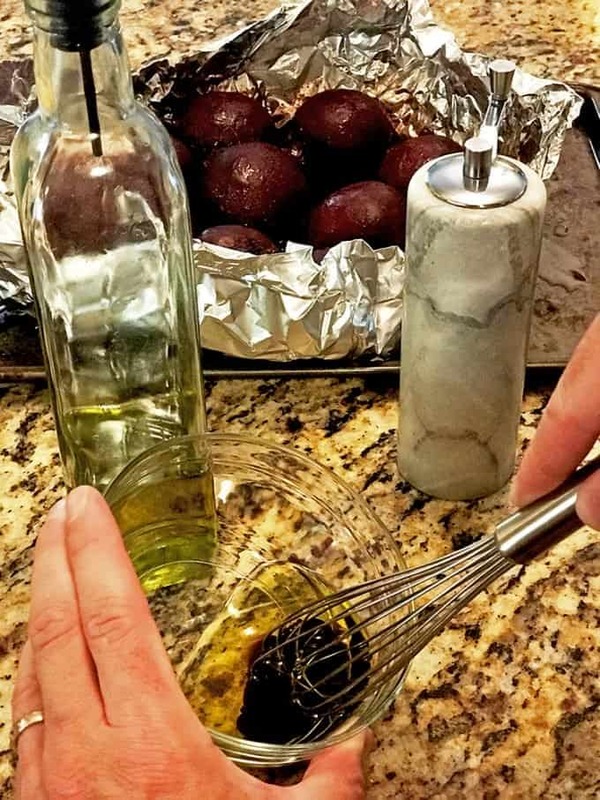 Place beets on a cookie sheet lined with foil and slather some olive oil on them, enough to evenly coat the beets. 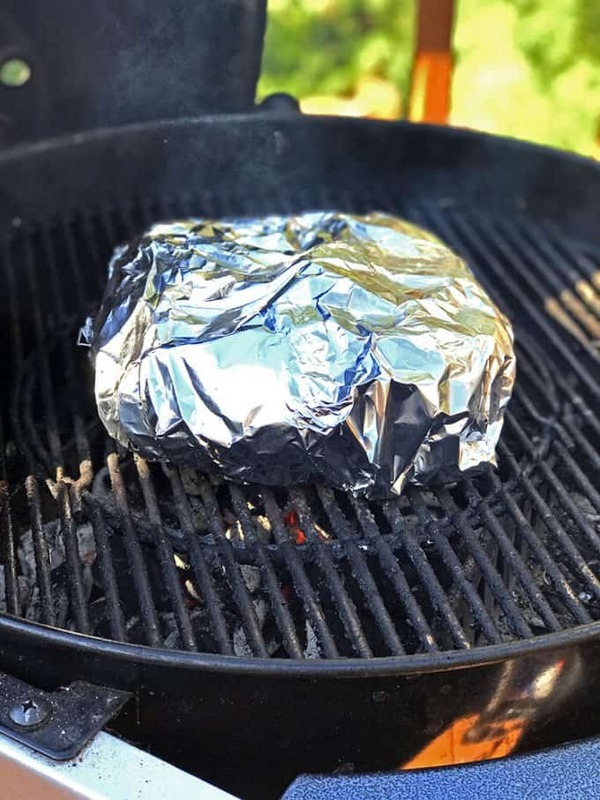 Use another sheet of foil and seal the beets and place in hot oven or on the grill, for about 20 minutes. While the beets are roasting, prepare the dressing by combining remaining olive oil with the balsamic vinegar. Add salt and pepper to taste and whisk thoroughly. 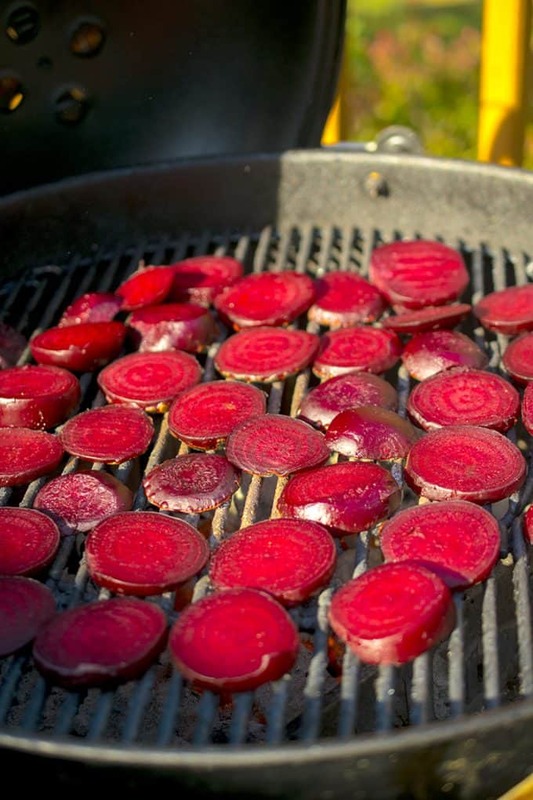 Remove beets from the grill and allow to cool. 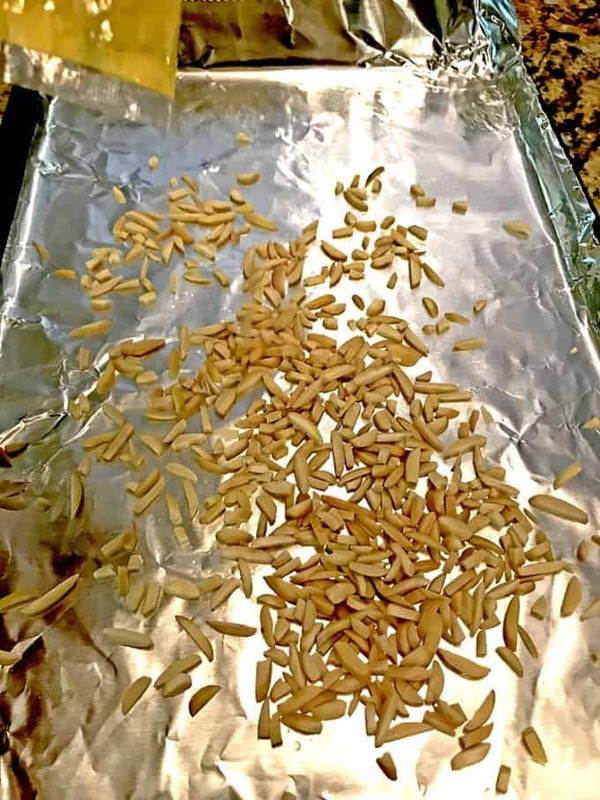 This is a good time to lightly toast the almonds, using either the oven or grill. They only need about 8 minutes to turn a light golden color. When the beets have cooled enough to slice, put on a pair of kitchen gloves if you have some and rub the skins off of each beet. Using a paper towel helps provide a little extra friction to make the process even easier. Next, place the beet slices directly on the grates of your hot grill, for just a couple of minutes until lightly caramelized and marked. Remove and allow them to cool. 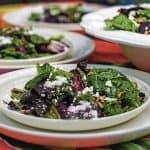 Use a large salad bowl and combine the spring mix with the roasted beets, toss in the almonds and the prepared oil and balsamic dressing. Add crumbled goat cheese and serve. This original recipe for this beet salad calls for green onions which I forgot to add! Guess what, it was fabulous nonetheless but I bet it's even better with them in it! 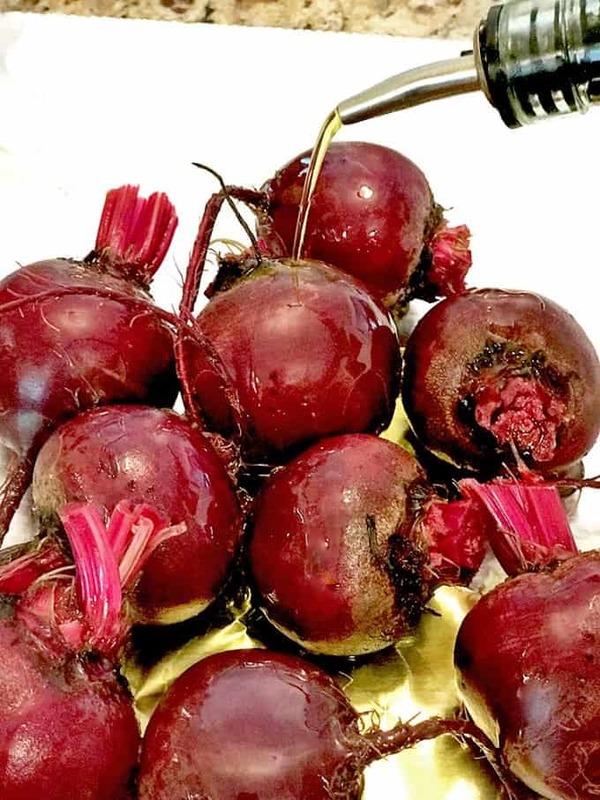 Make this Beet Salad Recipe and post it on Instagram. Be sure to tag us @plattertalk! Pin this beet salad recipe for later. Thanks so much Ted; we hope to see more of you here on Platter Talk!